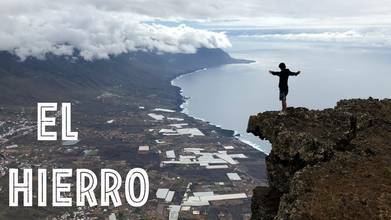 Description: El Hierro, t1hat beautiful island apart from the world, is the farthest to the west of the Canary Islands, in the Atlantic Ocean. English info: https://en.wikipedia.org/wiki/El_Hierro Spanish info: https://es.wikipedia.org/wiki/El_Hierro A natural espace, with a difference of altitude of 1200m, almost vertical, the most recent of those volcanic islands that form the Canary island, just 1MILL years LOL Thanks for watching and liking my videos, Subscribe! Follow me on instagram for more daily updates: https://www.instagram.com/lougedo/ Thanks to Armattan for the frames: https://www.armattanquads.com/ Video made with my 7" and the Freestyle 5" My 7" rig: DARC XR V2 LR 7" Hobbywing Stack 4-1 40A esc´s + F4 Predator Mini Camera TBS Unify Pro HV VTx 500mw 1500mAh 5s Battery GoPro Session 5 HW 2405 1800Kv Crossfire Rx V2 Genfam 6042props Bi My go to Freestyle quad: Armattan Chameleon TI 🙌🏼 Full KISS FC + ESC´s FPV Cam Runcam Swift 2 with 2.1mm lens TBS Unify Pro HV VTx 500mw 1550mAh 4s BrotherHobby R5 2306 2450kv Crossfire Rx V2 HQ 5x4.8x3 GoPro Session 5 (2.7k 30fps) Frsky Horus X12S + Crossfire Big Boy Dominator HD V2 LaForge Diversity module V1 Pepperbox + Skew plannar wheel antenna Music by: ODEZZA- Moment appart DISCLAIMER: You are hereby notified that the stunts and tricks displayed in this video are performed by professionals in controlled environments.. Do not attempt to duplicate, re-create, or perform the same or similar stunts and tricks at home, as personal injury or property damage may result. The producer of this video is not responsible for any such injury or damage. Copyright Disclaimer Under Section 107 of the Copyright Act 1976, allowance is made for “fair use” for purposes such as criticism, comment, news reporting, teaching, scholarship, and research. Fair use is a use permitted by copyright statute that might otherwise be infringing. Non-profit, educational or personal use tips the balance in favor of fair use.